Unique monthly podcast listeners have surpassed 75 million per month, and it’s safe to say that the radio-like media format is one of the most trendy and crowd-pleasing content types at the moment. Effortlessly incorporate podcasts in your ePaper - presenting them directly on the front screen. In addition to your current content offering, the ePaper will give your readers hours of engagement which ensure extra stickiness and loyal users. Give your readers that ‘little extra’ with articles narrated by real people. This is the ideal way to consume content when you’re unable to focus on the device, e.g. during the commute or when out jogging. The likes of podcasts and narrated articles open a new advertisement channel that enable the media companies to incorporate an extra variety of ads and sponsorships to their revenue sources. So, Audio Anywhere is yet another way to monetize the ePaper. 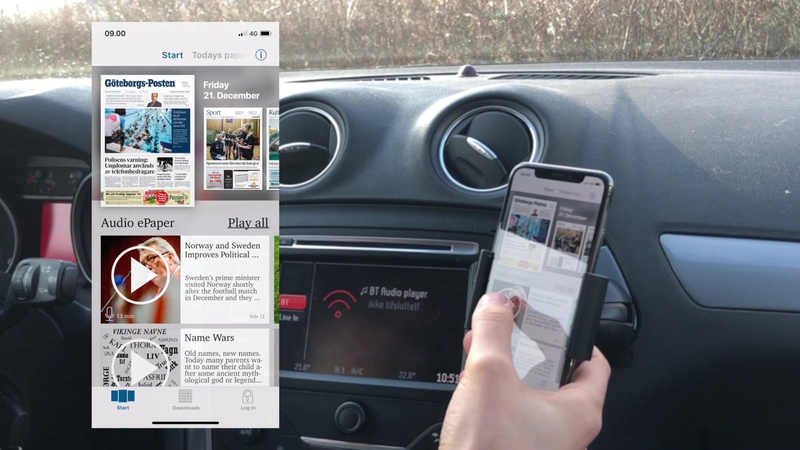 Your solution is compatible with iOS and Android’s build-in text-to-speech features, thus enabling you to consume the content of the newspaper or magazine without laying eyes on the publication. Our Audio features are compatible with all Bluetooth and Wifi-speakers meaning that your readers have numerous options to get their daily news fix whether this is through, loudspeakers at home, headphones on the go or simply by reading the old-fashioned way. No matter which of the Audio Anywhere features your readers make use of, you can rest assured that their activities are tracked and available in your Google Analytics overview. Here, you can find information about how many articles have been read aloud and for how long each article have been played. Audio Anywhere is also compatible with the User Tracking feature meaning that you can link the usage data to specific User IDs to ensure a transcendent data foundation.